I wanted to eat something healthy. 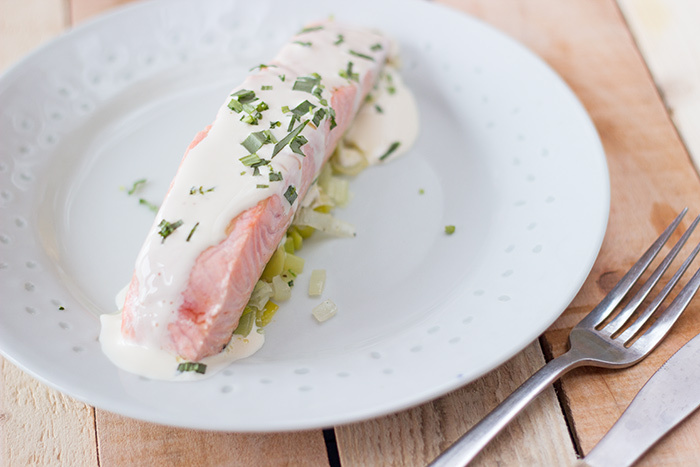 What is better than a salmon papillote with leek fondue? Okay, there is still too much cream in this recipe. However if you feel like it you can also replace the cream by some soya cream. The recipe will then become lighter and healthier but less French of course :). 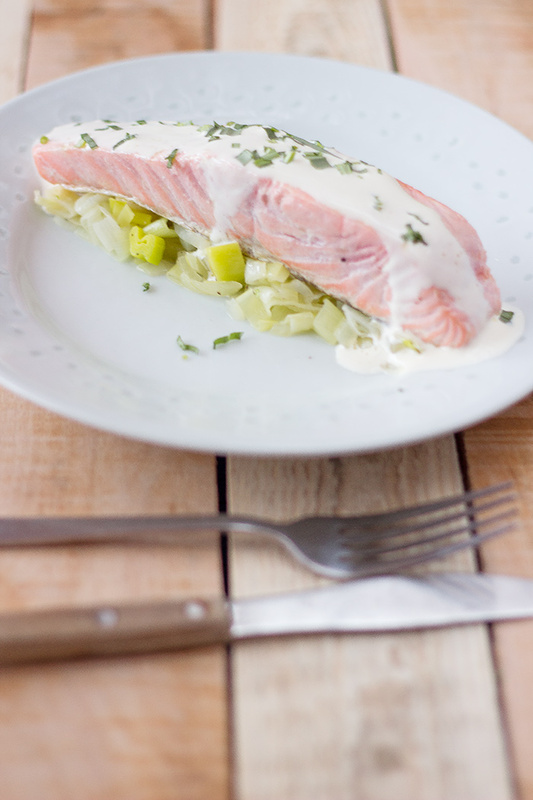 You can serve this salmon with the leek fondue only. However if you are terribly hungry, you can also make some rice or boiled potatoes as side dish. Mixing the rice together with the sauce of the papillotes is delicious. The sweetness of the leek fondue tastes wonderful associated with salmon. I also really like the contrast of the colors: pink, green and white. I always use aluminium foil to make my papillotes, then I place them in an oven dish in order to bake them. Never bought a proper papillote dish… yet! Author: a French girl "cuisine"
Peel and chop onions. Heat up a non-sticky pan with a dash of olive oil. Cook onions and leeks with a pinch of salt and pepper for 25 minutes stirring regularly and reserve. Cut 4 squares of aluminum foil to make your papillotes. Put a layer of leeks in each papillote. Place salmon filet on top. Pour some cream, add 1 pinch of salt and sprinkle with tarragon. Put the 4 papillotes in an oven dish. Bake for 10 minutes and serve. Thank you very much for reading. Register to the newsletter or follow me on social media to receive the latest recipes of a French girl “cuisine”.